Because of this conservation easement, Lightning Creek Ranch will always remain a working ranch while also protecting some of the most beautiful and ecologically important lands in the country. It is no secret there can be tension between conservation interests and cattle grazing, but the owners of the Lightning Creek Ranch in eastern Oregon have found some common ground. Lightning Creek Ranch owners the Probert family, led by Dan and Suzy Probert, have teamed up with The Nature Conservancy, the Natural Resource Conservation Service (NRCS) and The Climate Trust to ensure their 12,225-acre ranch will be managed to benefit both ranching livelihoods and the native habitat and wildlife it supports. 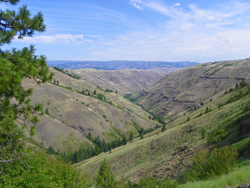 The Proberts have sold an agricultural conservation easement on the property that will prohibit conversion of native grassland caused by tilling or energy development, while allowing the property to be used for livestock grazing that follows a grazing management plan. Conservation easements protect land for future generations while allowing owners to retain certain property rights. Through an easement, landowners willingly sell or donate only those rights necessary to protect specific conservation values, such as fish and wildlife habitat. Easements are individually tailored to meet a landowner's goals and the landscape’s needs. Because the land remains in private ownership, with the remainder of the rights intact, an agricultural easement property continues to provide economic benefits for the area in the form of jobs, economic production and property taxes. In addition to helping conserve North America's largest remaining grassland of its type and supporting the local ranching community, this agricultural conservation easement prevents the Lightning Creek Ranch from any conversion for residential or commercial energy development or crops. Preventing these changes and maintaining the native grassland will keep an estimated 55,000 tons of carbon in the ground, a benefit that secured funding for this transaction from The Climate Trust. The match funding for this purchase—$1.3 million—was provided by the USDA Natural Resources Conservation Service through its Agricultural Conservation Easement Program – Agricultural Land Easements (ACEP-ALE). This program provides financial and technical assistance to provide long term conservation and protection of agricultural lands and their related benefits. Created in the 2014 Farm Bill, this is the first ACEP-ALE project to be completed in Oregon. After a generous gift of $700,000 from the Doris Duke Charitable Foundation, The Nature Conservancy is still privately fundraising $400,000 for the purchase of this land easement, which the Proberts sold to the Conservancy for $200,000 less than its appraised value. The Nature Conservancy is a global conservation organization dedicated to conserving the lands and waters on which all life depends. Guided by science, we create innovative, on-the-ground solutions to our world’s toughest challenges so that nature and people can thrive together. We are tackling climate change, conserving lands, waters and oceans at unprecedented scale, and helping make cities more sustainable. Working in more than 65 countries, we use a collaborative approach that engages local communities, governments, the private sector, and other partners. To learn more, visit http://www.nature.org. NRCS works with farmers, ranchers and forest landowners across the country to help them boost agricultural productivity and protect our natural resources through conservation.